Front of home facing Ariola Drive. This home has plenty of parking. This beautiful Gulf front home has lots of covered space underneath the home. The open floorplan is great for entertaining. The living room has plenty of seating. The beautiful kitchen has lots of counter space, breakfast bar seating and is open to the living and dining areas. Another view of the kitchen. The large dining table offers lots of seating and Gulf views. Bedroom 1 has 2 queen beds, private bath and TV. Bedroom 2 has 2 queen beds, private bath, TV, Gulf views and access to the gulf front deck. Bedroom 3 has 1 king bed, private bath, TV, Gulf views and access to the gulf front deck. Bedroom 4 has 2 queen beds, private bath and a TV. Bedroom 5 has 1 king bed, TV and shares the hall bath. Bedroom 6 is the master and has 1 king bed, private bath, TV, Gulf view and access to the gulf front deck. The Gulf front master bath features a large tub and walk in shower. The guest bathrooms have plenty of space. Another view of the large deck and amazing views. Enjoy outdoor dining on the large deck. Enjoy this gorgeous view from the home. The large deck has covered areas for relaxing in the shade. Lounge in the sun and enjoy the view. This beautiful home is ideal for a big event or large family gathering, this beautiful Gulf side home is 2,634 square feet, six bedrooms, six baths, and comfortably sleeps up to 18 people. Front doors lead into a bright entryway with stairs leading up to the main level. This open concept living area has a huge kitchen with long breakfast bar, tons of counter space, and an over-sized refrigerator/freezer combo. The living area has lots of comfortable seating, wall mounted flat screen TV and a wet bar. The dining table, with its bench style seating, can accommodate the whole extended family at meal times. Three bedrooms are to the right of the kitchen, all with deck access. Bedroom 1 has a king bed and private bath. Bedroom 2 has two queen beds and private bath. Bedroom 3 also has two queen beds and a private bath. Another three bedrooms are on the opposite side of the house. Bedroom 4 has two queen beds and a private bath. Bedroom 5 has a king bed and uses a hall bath that also services the living area. Bedroom 6 is a master suite with deck access, a king bed, and large private bath with jetted garden tub, and glassed in shower. The main level deck is incredible with shaded and open seating areas, full sized dining table, and clear acrylic railings for unobstructed views of the Gulf. Stairs from the deck lead straight down to the sugar white sand and emerald water. The carport area under the house is large and open for plenty of covered parking and additional entertaining space. My wife and I had our wedding at this property and it was an amazing experience. We would love to go back with friends and family for a return trip! The beach location for this house can’t be beat. The view is perfect and house is located close enough to town for easy access. Plenty of room for a large group. The house has a little wear and tear, but is in good condition overall. We would stay again. This rental beach house was absolutely perfect, with lots of amenities. Great parking, beautiful spot on the beach with gorgeous view and spacious home. We're so glad you enjoyed your vacation at 304 Ariola Drive and we look forward to your return! We had the most amazing time. We had our wedding here and the house was perfect. It was the perfect size and the view was incredible. Congratulations to you and your husband! We're so glad that you had a wonderful time and venue for your wedding. We hope to see you again for your 1 year anniversary! Had my family over for my special event celebrating my wedding vows and it was everything I pictured. Thank you for your review. We are happy to hear that the wedding celebration was everything you wanted! We hope to see you again for the one year anniversary! We were here for a Girl's Getaway. It was our second trip to Pensacola but our first time staying at this property. It was well laid-out, well appointed and we loved it! Thank you for your review! We're glad to hear you enjoyed your Girl's Getaway at 304 Ariola Drive! We hope to see you all again soon! 8 adults, 5 children and one dog rented this home for my father in law's 90th birthday celebration and it was more than perfect. My children and grandchildren stayed with my husband and me and we all had our own, clean, bright, sleeping quarters and ample room to enjoy our time on the beach. I have spoken highly of this home to my friends and recommend it to anyone needing a larger rental! 2 refrigerators, 2 dishwashers, large washer and dryer, everything you need! Thank you for taking time to post your review about your stay at 304 Ariola Drive. We're so glad you and your family enjoyed all of the amenities and that your father in law had a great 90th birthday! We look forward to your return! We rent beach houses almost every year from Paradise Beach Homes. We always have a fantastic time. When issues have arisen, they have taken care of them in a timely manner. I will definitely continue to use them for my beach rentals. 304 Ariola is a great house. My only suggestion would be to add a walkway down to the beach as most homes have. Otherwise, it was perfect. Thank you very much for your repeat business! We will discuss with the owner of the home about having a walkway down to the beach put in. We appreciate the feedback and look forward to your return! We're happy to hear that you enjoyed your stay at 304 Ariola Drive and we look forward to your return to Pensacola Beach! Wonderful for our family of 16. perfect house layout, perfect location. Everything just right! Thank you for your review! We're so glad you enjoyed staying at 304 Ariola Drive and we look forward to your return! We have stayed in this house several times and plan to return. It is convenient to the gulf, as well as to restaurants and shops. This house is comfortable and with SIX bedrooms and SIX bathrooms it gives visitors privacy. The view from the deck is spectacular day and night! Thank you for the review! We love this home as well and we're so glad to hear that you enjoyed your stay! We hope to see you again soon! We love the layout of this house. All 6 bedrooms on the same level. And all but one bedroom has a private bath which is great for families with little ones. Open living area with kitchen and dining area. Covered partial deck. The only complaint I have is the mattress in the Master Bedroom was not very comfortable BUT when loading car to leave a new mattress was delivered! Thank you for taking time to post your review and we're so glad to hear that you enjoyed your stay with us! 304 Ariola is a wonderful home and is perfect for family and friends. We look forward to seeing you next year! Lovely location and the house has the number of bedrooms and baths that a large family needs. Did have three maintenance calls while at the house - usual wear and tear of a house that is aging and exposed to the elements a bit. Thank you for taking time to post your review. We appreciate the feedback and are so glad that you enjoyed your stay. We look forward to your return! Stay and experience excellent. Wish we had been warned that the policy for keeping our same house for the next year has been changed . We rented this beautiful home to celebrate my Dad's 90th Birthday and it was an amazing experience. The home inside and out was beautiful and the view was spectacular, sunrise to sunset! Every bedroom and every bathroom was so clean and comfortable. The home is soundproof, so even in bedrooms you can have peace and quite. The kitchen, dinning area and living room were perfect for having family together and not feel crowded or cramped. All of my family and friends wanted to know how to rent this property in the future. And my 90 year old Dad would spend his 91st here too! Enjoy this beautiful property you will not be disappointed. We had an amazing vacation. Our children and grandchildren thoroughly enjoyed our get together. I would definitely recommend renting this beautiful home for a large group. The view is AMAZING!!! We had a wonderful week. Not only was the property acutely described, kitchen was fully equipped and there were extras to make our beach holiday a family event. Everyone is still talking about the great location and the privacy, we hope to be back next year! This house far exceeded our expectations. Perfect for a large family or group. Every bedroom has its own bathroom providing privacy. The back covered deck provides views of both the sunrise and sunset. We enjoyed every second of our stay and highly recommend. We had an amazingly wonderful time while we stayed at the Ariola 304 property. The reasons that location was rented was the table on the back porch on the beach, the great long table in the main room and of course ALL the other rooms and amenities!! We were so very pleased to have the additional refrigerator on the bottom floor for the drinks and the birthday cake :) and the bar area with the unlimited ice away from the main kitchen area couldn't have been better. The bathroom access for the 20 persons that were there for the actual birthday party on Saturday was perfect to include the tables were everyone could congregate and then the pictures off of the porch overlooking the Gulf were fabulous!! There were a couple of items as far as maintenance that need to be addressed but overall the place was a 10!! Back again for a second time. Floor plan awesome, perfect location. Feeling like the decor is dated and not very coastal. Wall color dated and art work falling off walls with big canvas torn. Bathrooms have mold around floor and tubs in places. Back left door has no lock on floor so doors kept opening up with wind. The whole double doors could not be secured. Fridge needs bottom shelf for storage. Poly wood outdoor furniture needs to be power washed to get rid of mold. Five adult girl cousins from five different states stayed at this beautiful beach home for our annual cousin getaway trip. We loved it!!! Not surprisingly, this was a bit pricier than other places we've gone, but the location, the view, the accommodations, the comfort, etc. was well worth it! Down the steps, over the dune path, and we were on the beach! I am already thinking this would be a great place to have an extended family gathering! On the beach, beautiful location, very spacious, but a little more upkeep was needed. Celebrated a union of two with family and friends. Everyone loved it! The beach house was perfect for our daughter's wedding. We were there Friday through Monday and enjoyed every minute. There was plenty of room to have the reception in the house and of course the ceremony on the beach despite hurricane Irma! It is however stocked with very little supplies, 1 roll of tp per bathroom, zero cleaning supplies (it needed a little cleaning upon arrival-sticky floors,counters,dead bugs,etc).After fixing that stuff5, it was a wonderful event and they were extremely nice at office too! Would definitely book again! We have stayed @ 304 Ariola 4 times since it was new. Location, layout and management has been great with the exception of changing check-in time to 5pm and most night lights were inoperable. The next items are for the owners: the house is greatly in need of general maintenance. Most door knobs need to be replaced. A lot of windows have lost the seal and are foggy. Exterior doors need to be adjusted to close easier. 16 of us go to the beach house every July for a week. We feel like we are at home since we always stay at the same house. The house is great as it is laid out so well for a group and it is always in perfect shape when we arrive. The beach is beautiful with it's white sand. Our 9 grandchildren say it is their favorite vacation every year!! Great location. Easy walking distance to restaurants and shopping areas. Our vacation was great, but this home needs some serious attention, outside doors don't easily close, keys don't work & can't be locked on all the exterior doors, air conditioning needs to be balances and had to be replaced while we were there, mold all over the shower curtain in all the bathrooms, the cleaning crew could have done a better job, a bridge needs to be build from the back patio to the beach entrance like comparable rentals in this price range! Loved this house. Very nice and accommodating for our large family. Well stocked. Exceptionally well maintained. It's a winner! Great weather & location. The entire experience was wonderful. Checking in and out was very easy. The rental property was in a wonderful location in front of the beach. The house was very clean and all furniture and bedst were in good condition. The kitchen was very spacious and well equipped. Overall it was a great experience. We had a great time during spring break, however it was a little cool some days.. Very nice kitchen. Wonderful with family from North Carolina, Texas and Arkansas . The weather also was beautiful. We LOVED it. The weather was cold and rainy but the house was perfect! Each bedroom having a bathroom was great. Our whole family said oit was one of the high points of the weekend. House was clean and we left it the same way. We appreciated being able to get in earlier without a big hassle. Would love to go back! Had a wonderful time with friends in this amazing beach front property. Our only complaint is that the deck should be husband had multiple slivers that we had to dig out and one of our other friends had to go to ER for a very large sliver that got infected! A couple of the boards are also uneven and caused some tripping! Other than that we love the house so much that we booked for next year! We have stayed here 5 different times. We think this is the best house on the beach. We would highly recommend it. We will stay there again next year. This was the best house we have ever rented on the Gulf Coast. Our children and grandchildren enjoyed everything from the roominess, ice maker, extra refrigerator and most of all, the covered porch and beautiful beach. PBH was easy to work with for a second year! The office staff was responsive and pleasant, as usual. Very nice - lovely home. Delightful experience for us, our kids and grandchildren. Gathering area for us all to be together for games and dining. Excellent porch for sun & shade where you could sit and see what everyone was doing on the beach. The Good: The house had plenty of open space for a large group. Plenty of seating inside and outside. The views were amazing. The staff at Paradise Beach Homes were very friendly and helpful. The Bad: One burner on the kitchen range did not work and this made cooking for a large group very inconvenient. Toilet seats and toilet paper holders were all loose. Trash had not been emptied in the kitchen upon arrival. Floor rugs were shedding on everything. Floor rug in the master bedroom had urine smell. Lack of kitchen storage containers. Outdoor grill was very dirty. Back deck flooring was coming loose, needed to be sealed and several people got splinters in their feet. Unattached bed headboards were noisy. We all enjoyed the vacation house. The house was clean and tidy. We enjoy the work Hope does for us by getting this house ready. We enjoyed our stay and we are sad that we cannot have it next year. Absolutely wonderful house; large and special and beautiful location. Agents were very professional and easy to deal with. Everything was as stated. Great space for our crew of 12..loved the view, furniture and distance to beach. However here are few things that need attention...internet is way toooo slow. The main bed/bath suite shower leaks pretty bad- we would go thru a towel per shower to mop the floor. Not enough good pots/all scratched and nasty. We did a lot of cooking when renting a house that large and there was not enough kitchen essentials(decent cutting boards/clean pans/etc. )Also dryer took forever- had to run a cycle twice to dry regular load- may want to check out. Overall great house-but could use a little TLC and upgrades- especially when you have a large crew. Thanks! We held my sons wedding welcome party a this house. Fortunately the weather broke and the wind died down as we had about 75 people in the car port for the event. It worked out very well, and we had it catered by Nancy's Haute Affairs who did a fabulous job. We had a couple of small issues with the refig and electrical in the car port, but the management team was Johnny on the spot and got them taken care of very quickly. A great week on the beach with friends!! House we just perfect...can't beat hearing the sound of the waves from the porch. Loved the layout with 6 bedrooms AND 6 bathrooms. Nature Cafe, Paradise and Hemingway's were our favorite places to eat. Definitely recommend 304 Ariola! We used the house as a vacation rental as well as a rental for our wedding. The house has a beautiful spectacular view of the beach from the balcony. Everything was really nice and it was a great experience for all of our out of town guests as well. This was a group of high school friends from the class of 1960 (55 years ago in Orange Co. California) most coming to FL for the first time. I live in GB, so it was my show. Trying to please 12 old ladies isn't always easy. However, to a person, they were beyond delighted with the house--the location, the decor, the amenities, the cleanliness--everything. It was fabulous. The location is close enough to walk to shops and to the pier if you wanted a longer walk. Frank and Lola's at the Margeritaville Hotel, and The Cactus Flower. For great dining, I recommend The Grand Marlin. It is more pricey, but excellent. Great place for oysters, as is Peg Leg Petes. We will definitely rent this house again in the future! It was well maintained, spacious, perfect for our big family and our daughter's wedding! Had to call the company when the air conditioning stopped working and they had it fixed within about 4 hours. I've stayed at this house several times and have always enjoyed myself. The house itself is very nice and the views from the balcony are excellent . The house is never very clean though. You cannot walk barefoot in the house. The bottom of your feet will be black. And there is usually a fair amount of dust on the ceiling fans. If your planning on using the oven it only has one shelf and hasn't been cleaned in years. For the amount you have to pay for a cleaning deposit, I would expect it to be more up kept . Rented this home for my daughters wedding. It was perfect! 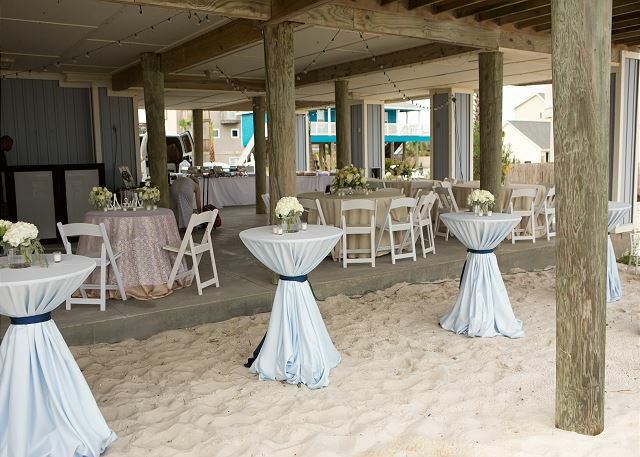 Wedding on the beach and reception under house. Plenty of room for guest to spread out and enjoy themselves,plenty of space for out of town guest to stay! As always, beautiful house, beautiful time at the beach with family. My very favorite place to be!!!! We recently rented this location for our family beach trip / our wedding. It was the perfect location, perfect house, perfect everything!! The staff at the office were fantastic! I would recommend Paradise Beach Rentals to everyone and will definitely be back!! Everything was comfortable and convenient! Totally enjoyable time with the family. Plan to return. We had a great time! The property could have been a little cleaner. Maybe a few rugs would help the sand situation. We booked this beautiful Paradise Beach Home one year ago for my daughter's wedding because of location, size, and simplicity of design and decor. How perfect it was to accommodate our event and guests. 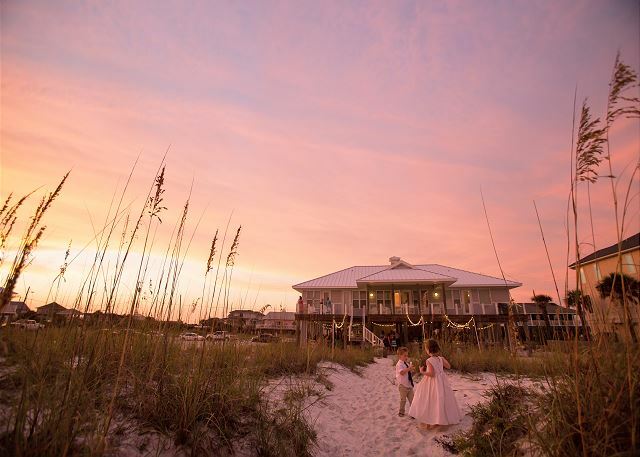 Breathtaking Gulf views, and convenience to the core of Pensacola Beach made this house a perfect choice to create a lifetime of wonderful memories. We plan to book this house again as it will feel like home the next time we all gather here. This is the best home we've stayed in on Pensacola Beach! It is laid out perfectly for privacy and getting together. The super long table with chair and bench seating was awesome for meals together, card games and puzzle time. The beach access couldn't be any better. There are no high rise condo buildings close by so you have a gorgeous, quiet beach to enjoy. The beds were very comfy and no one ever had to wait for a bathroom. We definitely want to come back in the summertime! The best weekend of my life!!!!!! Plenty of space for my wedding party to move around and feel comfortable. An outstanding home for friends and family to gather!!!! The management staff was customer oriented and very helpful. we had wedding on the beach and the path from the house to the beach is perfect for photographs. Drank coffee with the family on the balcony every morning while watching the sunrise. Everyone has own bathroom. We're going to make this an annual event! I can't say enough good things about Hope at paradise beach homes. She was so helpful. Great house! Perfect beaches! Our guests could not stop talking about how impressed they were with the house, the views, and the beaches! Paradise sent someone out to immediately address trivial concerns such as replacing lightbulbs. Couldn't have been more pleased and already are planning our next trip! This is a perfect home for big groups. The layout allowed for privacy and quiet time as needed yet had a nice big area to bring the group together at mealtimes. We had a problem with the wash machine but it got repaired (actually replaced) within 2 days. The house has two major issues - not cleaned well for a very long time and remodels were done "on the cheap" - especially in the master bath where the shower leaks into the bathroom. The cleaning was our main issue as that is not what we have come to expect from this rental company. We have rented from them for 10 years and this was our first negative experience with the cleaning. Stains on comforters, bugs in the rooms, mold in the shower, dirt still in bed sheets, sticky brown rails, and gross accumulation under trash cans in kitchen. I have learned to check who cleans the property before I rent again. Also bedrooms are smaller than other rentals. Speakers on patio are hanging by rusted wires. This is our second stay in this home and we have enjoyed it both times with family. Beautiful beach and great amenities! Great location and perfect layout for a large family. Our family of 14 found this property perfect. It could not be any closer to the beach and the parking was a huge plus. Great kitchen area and the extra fridge downstairs was a great help. Home was great for large numbers! Lovely home! Was surprised how spacious and accomadating it was for my entire extended families. Great gathering room with separate rooms from privacy. Lovely walk-out porch extending dining area while overlooking ocean. Only negative was it was the location where same day beach goers wanted to park(always thought we had visitors or wondered what they were up to) and the ocean was too murky. we rented this beautiful place for our wedding. We had 30 guests total, plenty of room for the meal after. Each room having its own bathroom made it great. Plenty of parking!